Every patient looks forward to the time it’s time to go home. Yet the time between discharge to departure is a critical and often stressful time. HealthPark Valet staff strives to help your patients feel secure in their final moments at your hospital to ensure a positive experience. We offer quality non-clinical care to your patients, just like the care they received from your staff throughout their stay. 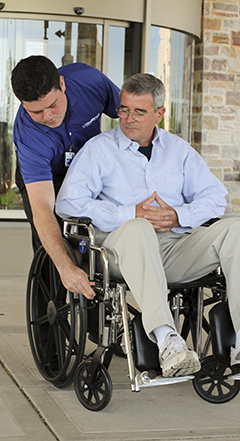 As part of our Patient Concierge Services, we make sure transportation has been arranged and that the patient understands their post-discharge care instructions. We understand you’ve worked hard to establish best practices with your systems and processes. We can work with your existing software and communication tools to simplify staff training as well as integrate with your current workflows. Contact us to learn more about a customized program to fit your hospital’s needs. In more than 500 surveys to date in 2012, 100% of patients surveyed would happily use our service again.